Originally uploaded by Mark M.
When I read the story on the Santa Ifigena grey market electronics market in Sao Paulo, I knew that I had to visit it while I was in Sao Paulo visiting Karen. Once I knew how to get from Karen's to the Metro on the bus (the handy dandy 675) I was able to get to Santa Ifigena by taking the Metro from Jabaquara to Sao Bento. Santa Ifigena is practically right there. I arrived around 10:30 AM, and the street based sellers were getting set up. I saw a few people selling PS2 and Nintendo game controllers, sunglasses, power supplies, cell phone covers. A bit further down the way, I found a smallish mall that had many different sellers inside. Many of them sold video games, and had somewhat expensive genuine copies. To put things in perspective, the local currency, the Real, is worth less than 45 cents Canadian, or 37 cents American (for the currency trader Geeks, todays exchange rates for 1 Real are $0.361298 US or $0.447178 Canadian). The Nintendo DS is about to debut in Brazil, and the ads that I saw said that it would be sold for 1,000 Reis. PS2s are sold for anywhere from 850 to 1,000 Reis, depending on the store, and games are 80 Reis and up. 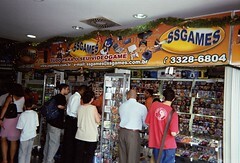 Sao Paulo has a booming market in Copied DVD and CD media. Sellers set up on street corners near heavy traffic areas, and copies of DVD's and current films are available for approximately 10-20 Reis. PS2 games are generally 15 Reis, including a printed case cover and a thin DVD case. Even the mall-based store sold copies of PS2 games. They had a binder on the counter, with covers of all the games that they offered. They sold the games for 15 Reis, and offered a 7 day warranty on the copies. The store probably made just as much, or more, profit selling pirated copies versus actual legal copies. For the North American consumer, prices for legal imported electronic goods are a bit high. I did see vendors selling PS One knock-off Polystations for around 100 Reis, but most console and peripheral prices were high. Visitors to the market should exercise caution, and this is repeated in most guide books, including the Lonely Planet. Santa Ifigenia is close to another area referred to as "garbage mouth" in which you are likely to find "desperate characters". Do not take valuables into the market, be careful of your money and bring a disposable camera. And, if you see the gentleman running the three shell game, please just keep walking. And for goodness sakes, don't try to take his picture! For more information on how I almost got beat up by 5 Brazilians, see the blog entitled " The Old Shell Game, or How I Almost Got Beat Up by 5 Brazilians"
posted by Mark M at 9:49 a.m.